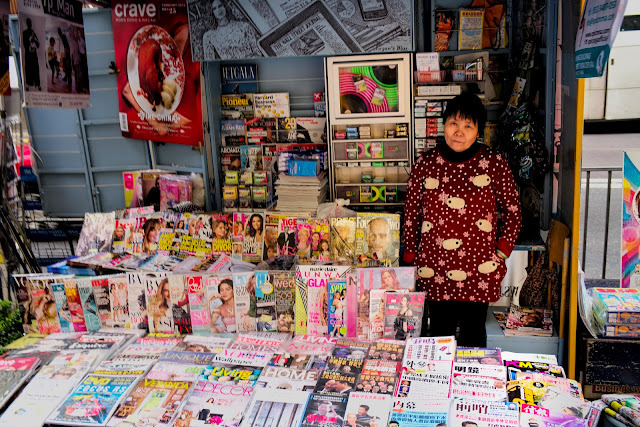 For today's photo, we're in Hong Kong, and our photo is of one of the many magazine vendors that dot the streets of Central. We shot this photo on our first trip to Hong Kong. Exploring the city for the first time, everything felt novel and interesting, and this photo nearly got away as we were constantly distracted by one thing after another. Shot on a 35mm prime lens, we were power walking to the station to get to the airport when this one old woman and her magazine stand caught our eye. Here in Hong Kong, we learned that sometimes in photography, you do indeed have to rely on instinct -you can't always stop to think or to compose. Of course it helps to have your camera pre-focused, and to be constantly monitoring lighting. The histogram is your best friend!